There’s a mobile advertising truck to suit every market, message and budget. Trucks are the transport vehicle of choice for wholesale and retail businesses, and they also carry the load for the manufacturing and building industries as well. While transporting items from “Point A” (the source) to “Point B” (the user) advertisers have always used the sides and backs of trucks to send a message from Point A to as many “Point C’s” (Customers) as possible along the way. Without question, trucks are definitely today’s workhorses for moving everything, and as far as advertising goes, companies sometimes assume there is no choice other than size for displaying their message. In other words, truck advertising has always been a popular and proven medium. In fact there are at least five non-static image truck advertising systems on wheels, and at least eight ways you can communicate with them. They may not move product, but they can go anywhere a car can go, and they certainly don’t slow down traffic! Everyone sees them, yet they bother nobody. They don’t even need to be moving while communicating messages from Point A to thousands of Point C’s. 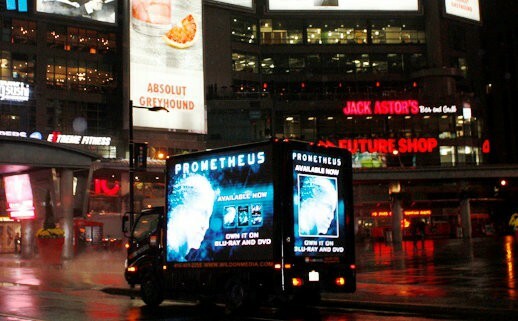 Sometimes when you park one of these super cool advertising trucks, people will come! In fact, some trucks continuously attract Point C’s via Bluetooth. Lately we’ve seen mobile advertising trucks used for some very exciting video, audio and mobile device promotions in Toronto – uptown, downtown, around town, out of town, on street corners and gathering spots, parked adjacent to commuter routes, at entrances to and exits from sporting and entertainment events, and on any day or night of the week. How many 18-wheelers can do that?